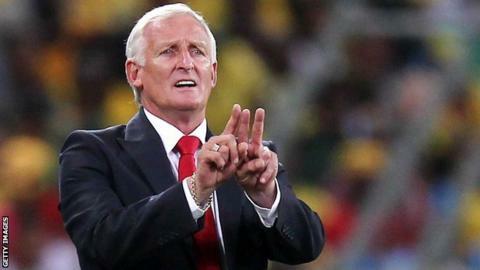 The South African Football Association has backed coach Gordon Igesund to lead the team until the 2018 World Cup. Igesund has received praise from SAFA bosses, despite not achieving their target of a semi-final place at this year's Africa Cup of Nations. The hosts were eliminated after a penalty shoot-out defeat by quarter-final opponents Mali in Durban. "I believe Igesund remains the best man in the country to coach Bafana," said SAFA president Kirsten Nematandani. "More important than making the semi-finals was the manner in which Bafana performed, improving to a level that exceeded our expectations since Gordon took over as coach six months ago. "If this level of performance is maintained there is no reason why Igesund should not be entrenched as the Bafana coach for the 2018 World Cup." South Africa were unbeaten over 90 minutes in four Cup of Nations matches, all against teams higher than them in the Fifa rankings, before losing 3-1 on penalties to Mali. But Igesund said his team had made "great strides" during the tournament following their exit. Less experienced Bafana players blooded by Igesund, including midfielders Dean Furman, 24, and May Mahlangu, 23, received praise for their performances, despite having fewer than 20 caps between them. Igesund's next challenge will be to guide a nation ranked 85th in the world to the 2014 World Cup in Brazil. Bafana must win their current qualifying group to reach a final qualifying play-off. Their two group games so far have ended in draws against Ethiopia and Botswana. Their next qualifier is at home, against Central African Republic, in March. South Africa have had 13 different head coaches since Carlos Queiroz took the reins in 2000, with the average tenure being around 12 months. South African sports minister Fikile Mbalula said he could see "a ray of hope" in the rebuilding of the nation's footballing fortunes under Igesund. He has suggested sports science needs to be taken more seriously in the development of Bafana players and has encouraged SAFA to work with the country's rugby union and cricket teams. "We will solicit expert and scientific advice from leading thinkers in the field of sports sciences," said Mbalula. "It will give a view to examining, in a holistic sense, the size, shape, and strengths of our football players, nutrition, access to modern technology, sports psychology, and early childhood preparations for high performance sports."